We posted back in September that the avast! WHS Edition BETA program was due to start on the 1st October (2007). A few days later than expected it is finally here and since the product is scheduled to be released in the first half of November 2007, this is a very short beta. 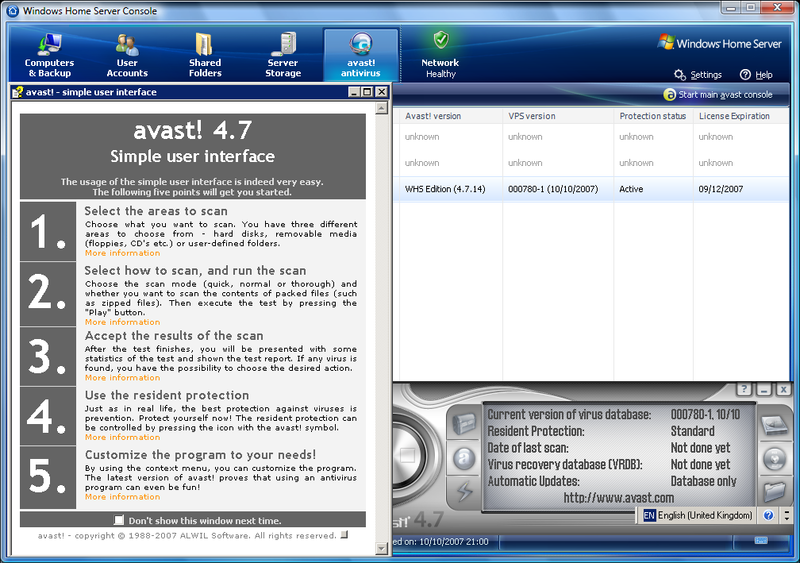 Besides providing protection of the Windows Home Server machine, it also supports the management of other avast! antivirus products on the home network if you have any installed. This is performed directly through the WHS console, by means of a new configuration page. The downloaded avast! WHS Edition beta package must be run on the server itself by using a remote desktop connection. When setup completes, let it reboot the server. If you have Avast installed on any of your client machines or want to install it on any of the client machines download the appropriate installer from section 2 or 3 from the avast! WHS Edition BETA web page and run the beta installer on the client machine in question. To access the management features, open the WHS console, and navigate to the “avast! antivirus” tab. The page lists all computers with the WHS connector (plus the WHS itself), their current protection status, their avast! version etc. 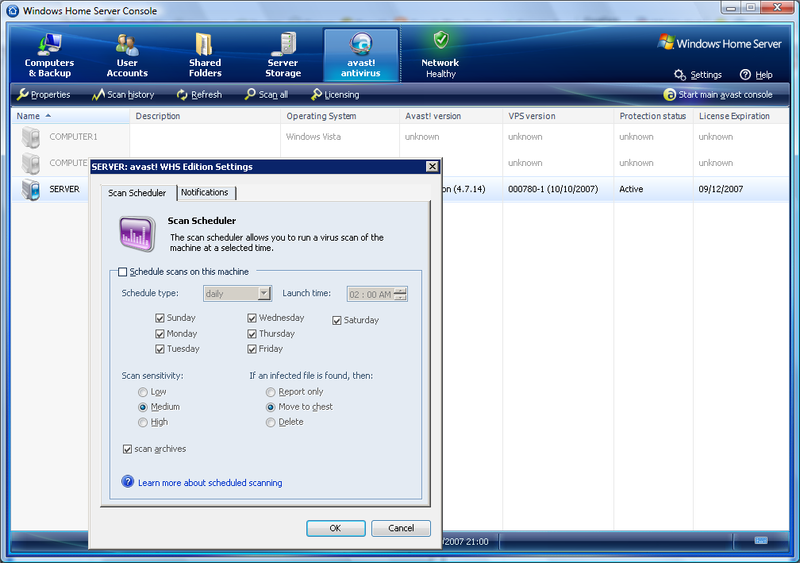 Via the Properties button scans can be scheduled and notification reports for different events reported. Scanning history, a scan all feature and even the machines’ subscription details can be updated. All of the above tasks can also be performed by a right click on the individual machine name including turning on/off of the shields and updating the software. The real power of the software comes into play once the “Start main avast console” is clicked. From here you can view your “captured” infected files, set the sensitivity of the resident scanner, update the virus database, select removable media and folders to scan and lots more. Just as if you were logged in directly to your server machine. More information and the downloads are available from the avast! WHS Edition BETA page. Additional help and support from the WHS section of the avast! support forums.